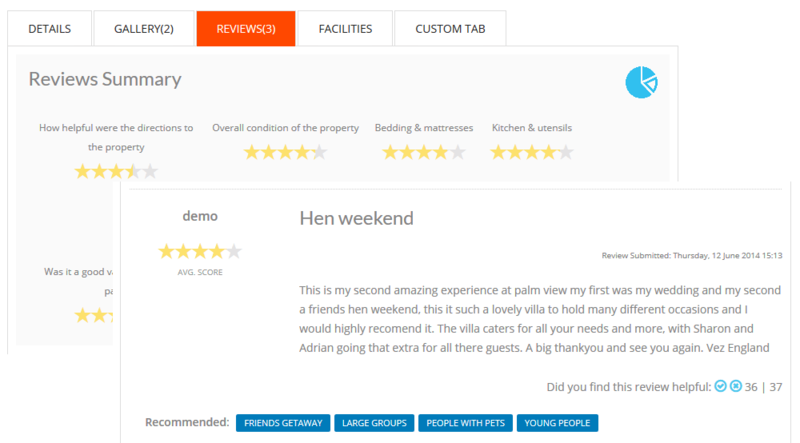 The ultimate booking and property rental extension for Joomla! The ultimate property rental extension for Joomla! Creating a Holiday or Booking Joomla Site is now quicker and easier than ever. Ready to use sophisticated designs and layouts. Responsive and mobile friendly design ensures scalability! With the responsive design capabilities of JomHoliday, your website design will automatically adapt to different screen sizes, and easily translate to a mobile platform from the desktop version. Wherever you would like to create a Booking Site or Portal, you can choose the respective layout. JomHoliday is very flexible giving you ability to create and customize your own layouts. Work with layouts that are Bootstrap 4. Easily edit layouts as per your requirements. 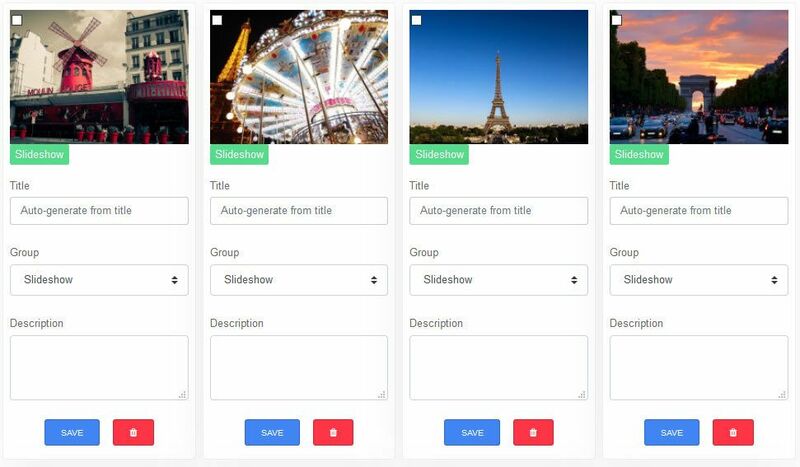 Bootstrap 4 is a lightweight and modular front-end framework. Interactive booking calendar with prices and availability. Give your site the features of the big league sites with Online Booking! 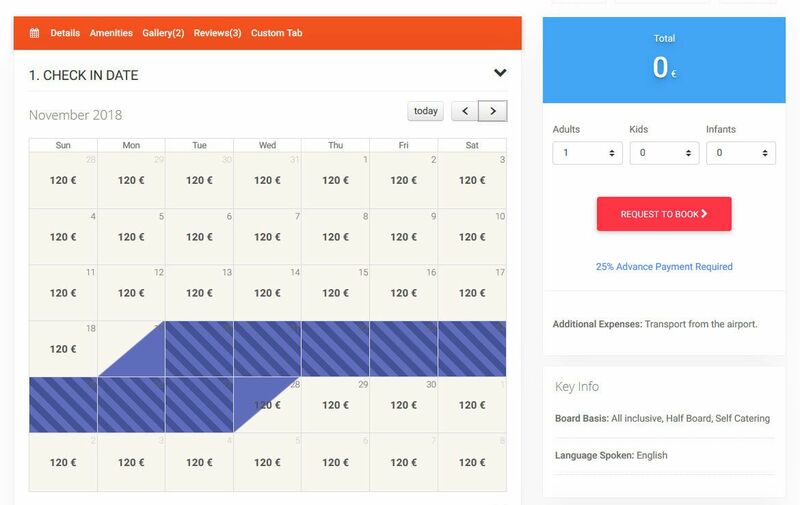 Advanced booking calendar means that the users are free to preplan their holidays easily. Price is automatically calculated based on resource price. Set minimum stay period, additional price information based on custom fields and more! Hassle free booking statuses inform users about the resource's current booking status. JomHoliday enables you to add unlimited resources, each with their own price and availability. Adding custom resources, each with their own custom fields and gallery, has never been easier. Adding seasonal, or other promotional, discount offers is now as easy as 1,2,3. Level the playing field with your larger competitors. Offer custom booking upgrades such as room cleaning, airport transportation, equipment rentals, and more. Each upgrade is configured separately, and the booking's price is automatically adjusted when the upgrades are selected during the booking process. What you can offer is only limited by your imagination. Add multiple tours with fixed dates range and prices. With JomHoliday you can set both resources and tours within same site. Built-in registration gives users flexibility to register and provide details when filling booking details. It is not mandatory to register first before the booking process starts. A confirmation email is sent after each step of the booking process. These email templates are fully customizable from the template back end. Advanced search algorithms that gives results in seconds. Search using Google maps within desired distance (between 10 and 200 miles/km) of origin address, city, or postal code. In a hurry? Use the My Location button as your origin address instead. Apart from regular search features that every other Joomla directory extension offers, JomHoliday also supports Joomla Smart Search. Find your search results at lightning speed! Let your users filter content super quick based on custom fields, categories and more! Quick built-in input field for searching through long lists of categories or addresses in the filter window. Lets you search and locate your live results on the map. Filter your results based on multiple search parameters and view your results in real time. Design your categories and addresses the way you want. Easily create unlimited levels of categories and sub-categories. Add images and descriptions to the directory tree layout to display categories. Create any structure of addresses. Much more detailed information with specific structure such as Country, Cities, Counties, Postal codes and more. With JomHoliday, the data structure changes to meet your needs, not the other way around. The flexibility of JomHoliday's data structure is made possible by its support of custom fields. Through these custom fields, you are free to create any type of content. You have a variety of input options including inputs, dropdown boxes, text, checkbox, link, tabs, and much more! Easily separate custom fields on your condition such as optional fields or mandatory fields. Custom Tabs - Create tabs for custom content with WYSIWYG editor support. Paid custom fields - Enable paid custom fields based on the Membership plans. Let your users know how their listings are performing with built-in reviews. Understand how satisfied your customers are with your services with advanced features such as ratings, recommendations and likes! JomHoliday supports built in reviews to let your listings be rated by users. Built-in captcha helps prevent spam. Notifies users that their reviews are approved via email. Both Knob style and Star style ratings supported. Advanced User Panel interface with professional dashboard, statistics and membership information. Create new listings within seconds, edit and publish reviews, add images, add additional information and much more! Change your membership settings and view private messages sent by customers. View your listings and statistics for each listing separately. Approve comments right from the dashboard. 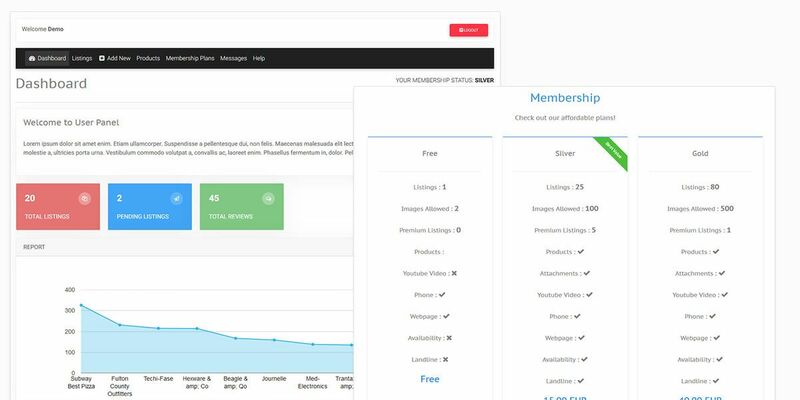 Add membership plans for your users and generate revenue! Create Join page with registration support that attracts more users. Users can upgrade their membership easily through the Front Admin panel. Latest SEO improvements for best results. Not just the content and indexing, but JomHoliday has taken care that every URL link is also SEO-friendly. JomHoliday understands the importance of being Search Engine Friendly and thus offers maximum resources to achieve that! With multiple SEO features such as optimized listing titles, correct indexing of all pages by search engines, individual SEO settings for each listing, and much more, you can never stay behind your competitors. JomHoliday also supports Joomla Breadcrumbs and integrates Rich Snippets. Rich Snippets are very powerful in letting users know what your page talks about at not in first glance when they run their query on any search engine! Sophisticated, fast interface with usable statistics, dashboard info and notifications. Sophisticated and state of the art dashboard with vital information, statistics, component version and news! Control your directory with much more power using multiple features in the Back Admin interface. Maintaining your directory will no longer feel like a chore. The side navigation panel provides quick and easy access to all of the important features, whenever you need them. No fuss maintenance that gets you back to the important things. 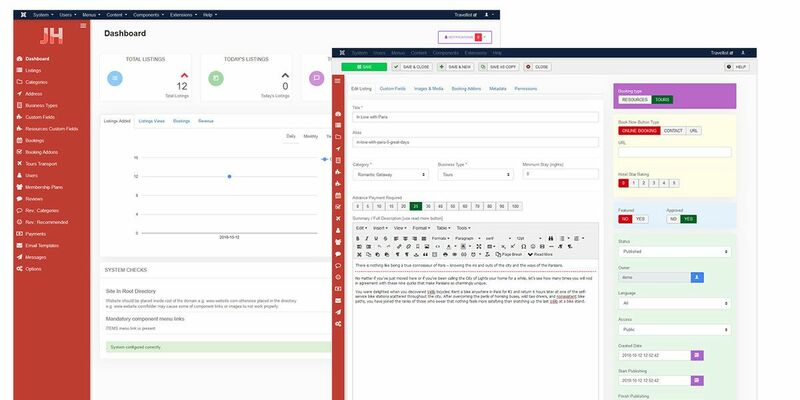 Along with the powerful dashboard and great navigation, all of the forms have been redesigned to follow the latest UI standards. Consistent, functional, and looks great too! Drag & Drop media uploader with easy order settings. Upload individual logo for each listing and give your users additional information with YouTube videos. Modules with multiple configuration and layouts settings. Select which fields you want to include in your search parameters for your users search queries! Choose from multiple layouts and configuration options. Display the latest listings added to your directory with ease using the Items Module! Vary the layouts and configuration options for new experience every time. JomHoliday fully supports multilingual content. All elements such as Categories, Custom Fields or Addresses can be translated into any language, with complete ease! Joomla URL aliases support for all your non UTF-8 characters. Engage with your social media fans and users with Facebook, Twitter and Google+ integrations! Let your customers know everything about your directory as it happens. Display JomSocial users profile under listing view with name and picture. Post information JomSocial wall. Each of JomHoliday's many email templates is fully customizable from the back end using the built-in visual editor. Add multiple tags to each listing in the directory for powerful search results! Search integration for tags ensures your results are relevant to the queries made. Access detailed documentation to understand JomHoliday even better! Easy to read and understand documentation for quick learning. Get quick answers to your queries through JomHoliday support forums! Experience email and support ticket resolution at lightning speed. Get started with JomHoliday today!